“At GlamSci, we are dedicated to helping disadvantaged men and women into careers and education in STEM. At the BETT show 2019, I was attracted by a table with geodes and muffins spread across the front – a very strange mixture. They were not selling food, they were promoting GlamSci, which is a new opportunity for science in schools. They develop fun classroom materials and activities offering support for teachers and motivating children. GlamSci is a fairly new charity group based in London that supports young people and helps to further their understanding about science by trying to change the age-old perceptions of the subject. 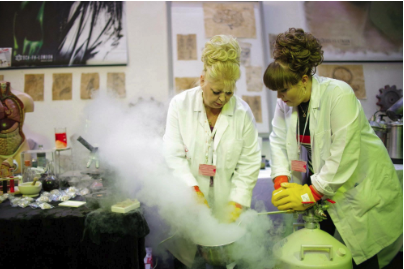 They are likely to come into school and make liquid nitrogen ice-cream or cover rat dissection! The sessions are free, but they may ask for a contribution towards travel and materials. The charity group could be fantastic on a special day event, a science event or maybe even a summer fete.